Maybe you got caught in an infamous California speed trap. Or perhaps you feel you were unethically targeted when the officer pulled you over last week. Either way, when you get assigned a traffic violation that you think is unjust, you should take steps to challenge it. This helps you avoid unnecessary fees and driving citations. You have a right to a fair trial to challenge traffic tickets in Baldwin and to keep your driving record clean. Working with a legal team familiar with traffic laws and court procedures is an important step to take before stepping into the courtroom. If you find yourself in a situation where you are given a ticket for a traffic violation, then you will soon have your day in court. Trying to go at it alone, though, can be a bad decision. You need a Baldwin Park DUI ticket attorney who has the skill and knowledge to ensure you get treated fairly. That is where The Ticket Clinic can offer a helping hand. A traffic violation adds points to your driving record that have financial and legal repercussions. Insurance rates may increase or driving privileges may get revoked. Knowing how to get out of a traffic ticket in Baldwinkeeps you on the road. The key to getting a traffic violation dismissed is having a well-constructed case that presents why the violation is invalid. We have lawyers familiar with a wide range of traffic violation specifications, including traffic accidents, speeding and D.U.I charges. Knowing more about the law behind a violation makes it possible to develop a defense strategy that gets the violation dismissed. For example, familiarity with how red-light sensor technology malfunctions is a piece of information that can be used to build a case. You may know that a traffic violation was assigned incorrectly and we as legal experts know how to prove it. Let the legal expertise of The Ticket Clinic help you figure out how to get rid of a traffic violation. Our process includes a 22-step procedure checklist developed using over 30 years of experience in traffic court situations. Get rid of a traffic ticket by seeking legal counsel and exercising your legal rights in traffic court, where if necessary you are represented by real people who care about your rights and know how to defend them. Let us be the ones to offer you guidance during this tough time. Do not end up in court wishing you had representation. It can be tough to handle it by yourself. We offer affordable services for every issue from a DUI to a Baldwin Park red light camera ticket. Plus, we now our stuff. Our record speaks for itself. 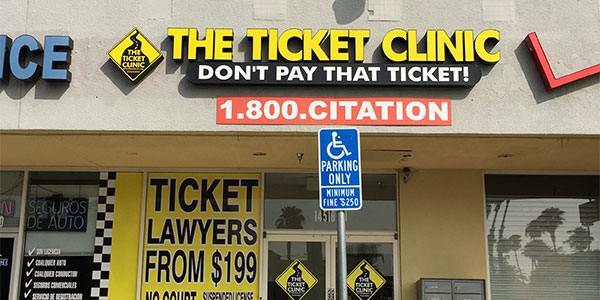 When you need a traffic accident ticket lawyer, The Ticket Clinic is here for you. Even if you face more serious charges, we have a skilled attorney ready to offer you the help you need to get through your court date and ensure you get treated fairly. We can offer you a speeding ticket fix or help you through a DUI case. Our complete knowledge of traffic laws and winning record make us the right choice when you need help. Don’t wait any longer. Contact us right away when you have traffic violations. You can reach us by phone at 1-800-248-2846 or stop by our website can contact us here.